i figure since i received 2 christmas cards in the mail yesterday, it's completely appropriate to post our christmas card 3 days late. hope you all had a marvelous holiday with loved ones and lots of delicious food. it's all about the food, amirite? Super cute!! Look at River! Ah! Such a sweet little baby! I hope you guys had a great Christmas! Oh man!! So dang cute. Happy Holidays to you! such a great card! Hope you and your family are having a wonderful holiday! Waaay too much cuteness for one card to handle! they turned out so good! love them!!! super cute!!! your son is adorable! Such a cutie bear. Merry late Xmas to you too! So sweet. Little ones make the holidays that much more special. Love you and hope you guys enjoyed it, too! oh and it's such an adorable one, too! love it! happy late christmas and a happy new year, too! great card! love the naked laughing photo!!! 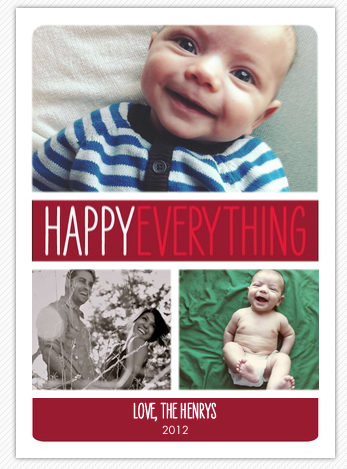 what a beautiful holiday card - "happy everything". hope you had the best holiday, especially being baby's first christmas. happy 2013! Just found your cute blog, am now following via GFC!